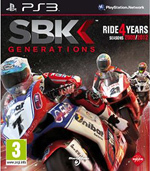 All Rounds include Superbike and 600cc Superstock except USA is Superbike only. 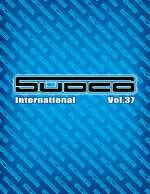 • NCR D16! OMG 240hp / 316 pounds! 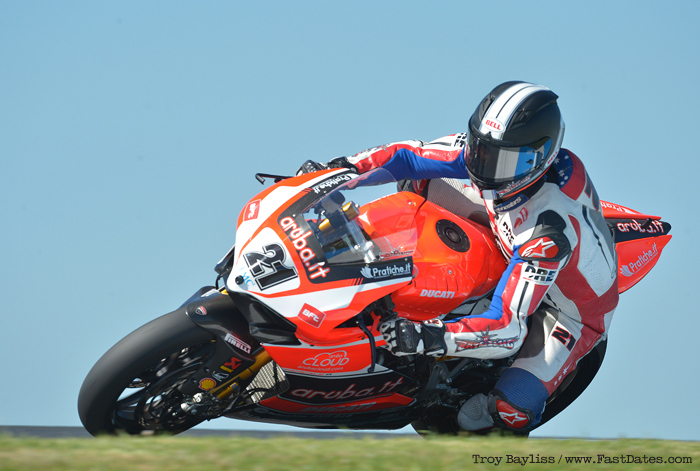 A Good Start for the Aruba.it Racing – Ducati Superbike Team today at Phillip Island, with Chaz Davies scoring two third place finishes in these opening races of the 2015 Superbike World Championship season. Race 1 – Today’s races took place in hot conditions with track temperatures of 42°C for race one. Davies, from second on the grid, was lying third through the opening stages, right behind Haslam and Rea. This British trio battled it out for the podium positions for the entire duration of the race, passing and re-passing each other in what was a spectacular opening race. Welshman Chaz pushed hard all the way to the line but, struggling to find acceleration through the turns in the final laps, he was unable to get ahead of his rivals, crossing the line in third position. This is an important result both for the team, that opens the season in a positive way, and the rider, who steps up to the Phillip Island podium for the first time in his career. Bayliss, twelfth on the grid, got away well and was up into seventh place by the second lap. 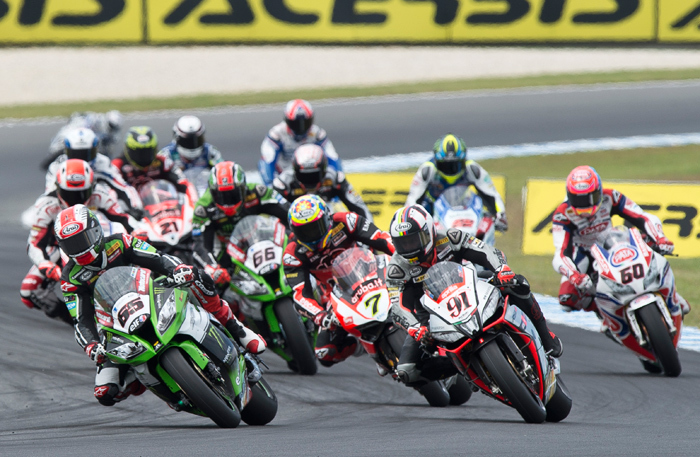 The Australian rider battled with various riders throughout the race, Torres, Guintoli and Sykes included. Unfortunately tyre performance dropped off significantly in the later stages of the race and Troy gradually lost ground as a result. The three-times world champion crossed the line in final thirteenth position. Race 2 – In race 2, and in very similar conditions, Davies made a strong start, and was up in second by the end of lap one, together with Rea and Haslam, as in race one. On lap two his pace was such as to record the best lap of the race (1’31.725). The Ducati rider was lapping in third/fourth position for a good part of the race and, able to manage the tyre situation effectively, he even took the race lead at one point in the final stages. A fantastic battle to the line ensued, and saw Chaz finish once more on the third step of the podium, earning himself more important points for the championship. 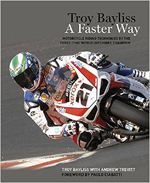 Bayliss made up several positions in the initial stages and was lying eighth through the opening laps. Similarly to race one, he started to suffer from significant tyre wear towards the mid-race point with the situation becoming serious enough for him to return to the garage on lap thirteen for a tyre change. Returning to the track in eighteenth place, he could only do so much in the limited time remaining, finishing his race in sixteenth place. At the end of the opening round of the 2015 Superbike World Championship, Davies lies third with 32 points, and Troy Bayliss takes 3 points to place nineteenth. In the manufacturer’s championship, Ducati positions third with a total of 32 points. The next appointment for the Aruba.it Racing – Ducati Superbike Team will be Round 2 of the championship, taking place at the Chang International circuit in Buriram, Thailand over the weekend of 20-22 March. Nico Terol and Matteo Baiocco concluded two solid races, a positive end of a weekend in which the team made continuous improvement, increasing the experience that will serve them in the next championship races. Nico Terol, started race 1 from the second row, in sixth position, and finished in eighth position, after making a fast start that saw him lapping with the leading group for the first few laps of the race. Strong winds caused him to struggle a little more and he was forced to slow down, nevertheless obtaining a solid result. In race 2 he suffered from a few problems at the start, committing a few errors that caused him to lose ground. From the mid-race point he regained his rhythm and the right concentration, managing to finish in sixth place and earning important championship points. Matteo Baiocco, who started from eleventh on the grid, just missed out on a top ten finish, closing race one in eleventh position. He had better pace in race two, with the team having made small changes to the bike, and he was able to conclude in ninth position. It was not easy for Matteo, with two tough races in the same day, but he achieved positive results and important points. Now the team prepares for the next round, scheduled for the 22 March at the Chang International Circuit in Thailand. Yamaha's incredible new YZF-R1M Superbike! EICMA & IMS 2014/15 Bike Show Coverage! Shooting Fast Dates with Czech SBK Girls Jitka and Petra! 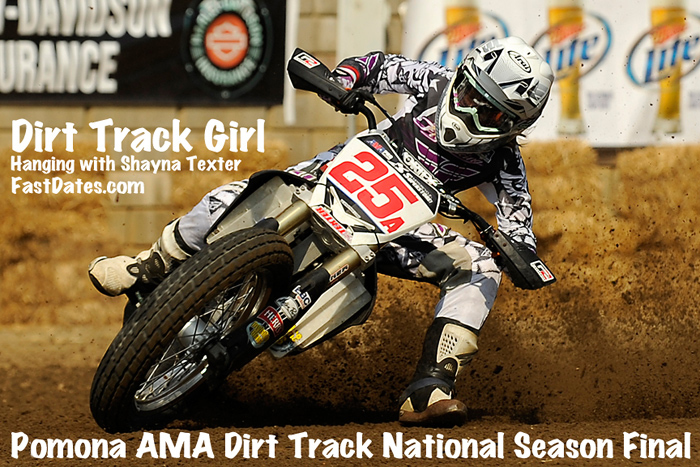 • Is a New Organizer for AMA Pro Roadracing Enough to Save It? • Polais Slingshot 3-Wheeler - Is it a Motorccyle or a Car? • EICMA 2014 Bike Show from Milan, Italy - The Hot New Sportbikes! • Fast Dates Edelweiss Tour of the Pyreness in Spain and France! • Ducati 821cc Baby Monster is Born! • EBR 1190RS Superbike Revealed! • Bimota and Alstare Join Forces for World Superbike 2014! • Burough Superior Moto2 and Production Bikes revealed! 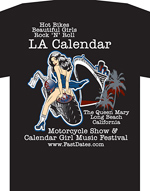 • 2013 LA Calendar Motorcycle Show - Hot Bikes and Kittens! 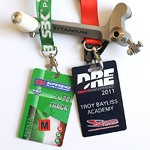 • DRE Troy Bayliss Racing Academy - Exclusive First Test at 180mph! 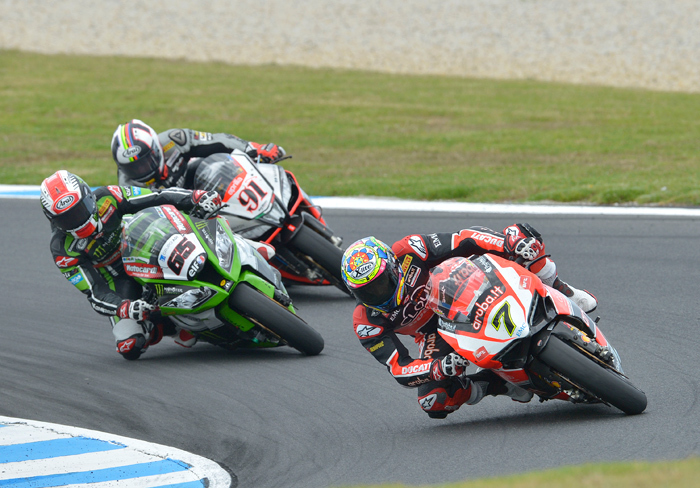 First and last lap action for the lead in both races was this close as the 2-015 Eni SBK World Superbike Championship Kicked Off this week in Phillip Island. From left to right: (1) Chaz Davies / Arub.it Ducati, (65) Jonthan Rea / Pata Honda, (91) Leon Haslam / Pata Honda, (81) Jordi Torres / Aprilia Red Devils, (6) Tom Sykes /Motocard Kawsaki, (60) Michael van der Mark / Pata Honda. Phillip Island, Australia, Feb 16-22nd 2015 – The Opening Round of the 2015 eni FIM Superbike World Championship was held in hot and sunny conditions at the Phillip Island circuit, and in Race One it was Jonathan Rea (Kawasaki Racing Team) taking the opening victory of the year after a titanic 22-lap fight with Leon Haslam (Aprilia Racing Team – Red Devils) and Chaz Davies (Aruba Ducati SBK), who completed an all-British podium. Race Two of the Swann Insurance Australian Round was another one to remember, given the thrilling finale that saw Leon Haslam (Aprilia Racing Team – Red Devils) edging out Jonathan Rea (Kawasaki Racing Team) for the win at the finish line by just 0.010. 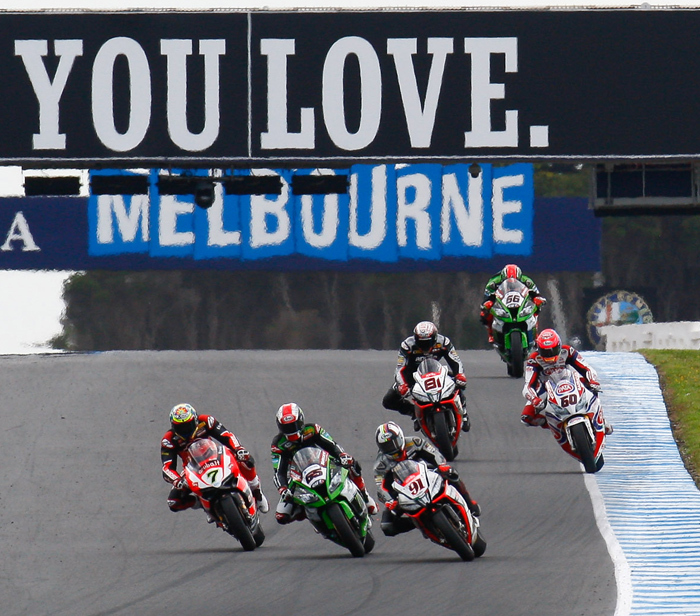 Complete Race Week coverage from Phillip Island continues below. 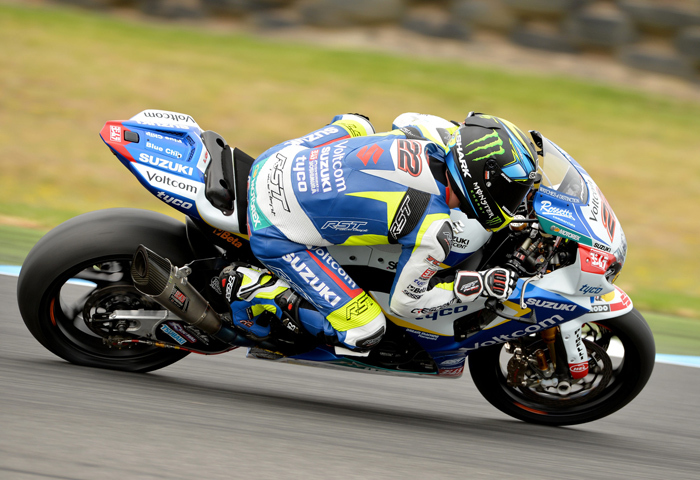 Alex Lowes was quickest in pre race testing on the Voltcom Cresent Yoshimura Suzuki leading up to the season start. Phillip Island, Australia, Feb 16-17th 2015 – Two 120-minute sessions on Monday kick started the WSBK Official 2-Day Test, the final pre-race test and ahead of the 2015 eni FIM World Superbike Championship season opener with Alex Lowes (Voltcom Crescent Suzuki) sitting pretty atop of the combined times. With almost perfect weather conditions the 25 protagonists who will do battle in Sunday’s 22 lap races relished the opportunity to fine tune their machines across the opening two timed periods. Ex MotoGP racer Randy De Puniet (Voltcom Crescent Suzuki) led the field for the first 74 minutes of the day before Leon Haslam (Aprilia Racing Team – Red Devils) and former World Superbike Champion Tom Sykes (Kawasaki Racing Team) each took their turn at the top, but it was in the afternoon when the times really tumbled. The Frenchman crashed at the high speed turn 11 in the closing minutes of the afternoon, sustaining bruising and took no further part in the day’s proceedings. 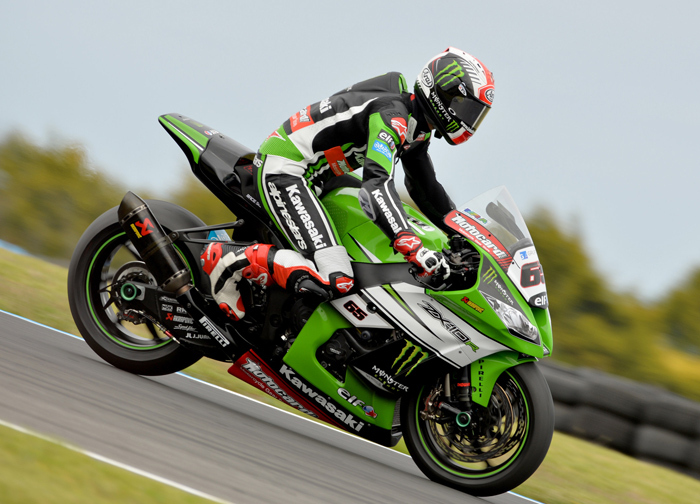 Jonathan Rea (Kawasaki Racing Team) ended the first 2 hours on track a fraction ahead of his team mate Tom Sykes. In the early minutes of the afternoon, Italian Davide Giugliano (Aruba Ducati SBK) crashed at the fast turn 11. He was unable to rejoin. When the circuit re-opened it was former World Champion Tom Sykes who produced a run of fast and consistent laps to close the gap to his new team mate before a number of riders set personal improving laps. With 2 minutes to go Alex Lowes (Voltcom Crescent Suzuki) unleashed the fastest lap of the test so far to edge session one pace-setter Jonathan Rea by 0.331s. Leon Haslam also improved late on, displacing Sykes who ended day 1 in 4th overall ahead of the impressive Spanish rookie Jordi Torres (Aprilia Racing Team – Red Devils) and Davide Giugliano whose time from the morning kept him in 6th. Sykes did however have the accolade of completing the most laps – 72 in total. Chaz Davies on the second of the factory Ducati machine was 7th, Randy De Puniet 8th, and reigning World Supersport Champion Michael vd Mark (Pata Honda World Superbike Team) 9th. Former 125cc World Champion Nico Terol rode his Althea Racing Ducati into 10th overall ahead of compatriot and 2014 EVO winner David Salom (Pedercini Kawasaki) who was 11th. Reigning World Champion Sylvain Guintoli (Pata Honda World Superbike Team) eased into his title-defending season with 13th overall just behind MV Agusta Reparto Corse’s new recruit Leon Camier. The new-look Team Hero EBR squad of Niccolò Canepa and Larry Pegram were in fine form with Italian Canepa claiming an encouraging 14th at the end of 4 hours of testing. Australian wildcard Jed Metcher was 18th overall on his Superbike debut, improving significantly in the afternoon session. Of the other rookies Roman Ramos (Team Go Eleven Kawasaki) was 19th, Santiago Barragan (Grillini SBK Team) 22nd and the youngest full time entry in this year’s series Christophe Ponsson (Grillini SBK Team) 24th. Former factory Honda rider Jonthan Rea on his new Kawasaki bested teammateTom Sykes. 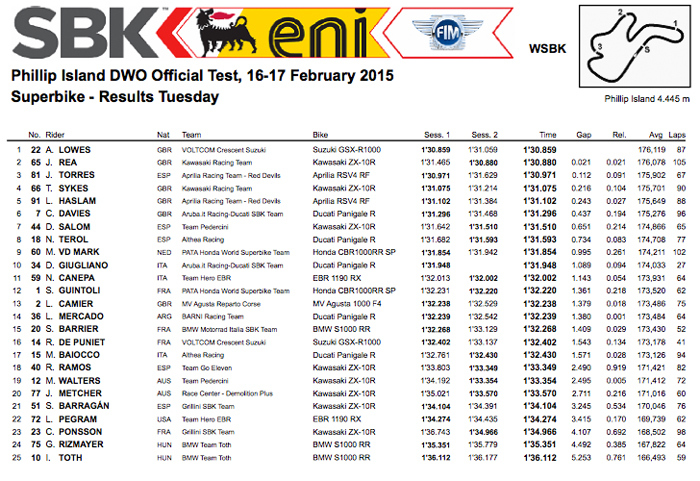 Tues Feb 17th – The second day of testing ahead of Sunday first two eni FIM Superbike World Championship races of the 2015 season saw Alex Lowes (Voltcom Crescent Suzuki) better his own time from yesterday, ending the day in top spot, 0.070s under last year’s race lap record. This morning’s first test ended with some impressive performances from a number of World Superbike rookies, especially Spanish riders Jordi Torres (Aprilia Racing Team – Red Devils) who finished 2nd and Nico Terol (Althea Racing Ducati) who was 8th. After 8 hours of on-track action and as testing concluded over 2000 laps had been completed by the 25 entered riders across both days.Behind Lowes, Jonathan Rea (Kawasaki Racing Team) and Jordi Torres completed the top 3, the trio covered by only 0.112s. 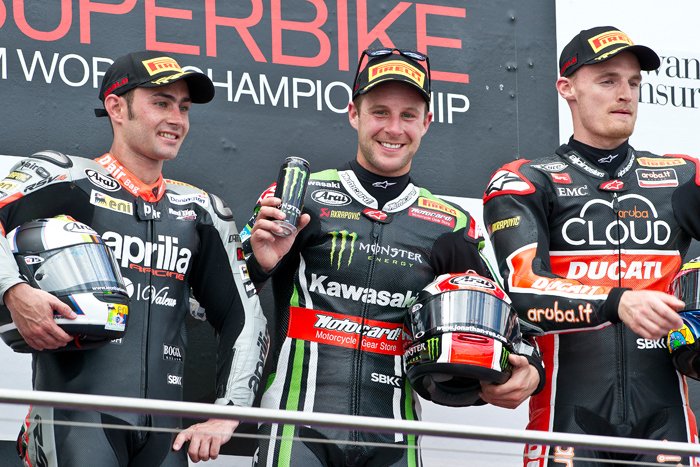 With Tom Sykes (Kawasaki Racing Team), Leon Haslam (Aprilia Racing Team – Red Devils) and Chaz Davies (Aruba Ducati SBK) completing the top six on combined times, and with 7 manufacturers in the top 13, the scene is set for the opening race of WorldSBK 2015. Davide Giugliano (Aruba Ducati SBK) was not in action on day two, while Randy de Puniet (Voltcom Crescent Suzuki) made an appearance this afternoon, both riders suffered crashes yesterday. Former World Champion Sykes suffered a crash as the test entered its final hour but was able to rejoin the action as did reigning champion Sylvain Guintoli (Pata Honda World Supersport) who tumbled while on a personal improving lap in the final eight minutes. Sylvain Barrier (BMW Motorrad Italia) suffered a high speed crash entering the Gardner Straight but was able to walk away from the incident, unlike 12 months ago when he suffered a similar crash at the same corner. Leandro Mercado (Barni Racing Team Ducati) joined the list of fallers, the Argentine rider’s condition will be reviewed on Thursday. The on-track action is set to resume on Friday with the opening Free Practice sessions which will officially start the 2015 WorldSBK season. Wednesday 18th - Australian motorcycling legend, 45 year old Troy Bayliss, will race at the Superbike World Championship season opener at Phillip Island this weekend – replacing injured rider Davide Giugliano who crashed in testing on Monday and injured his back. 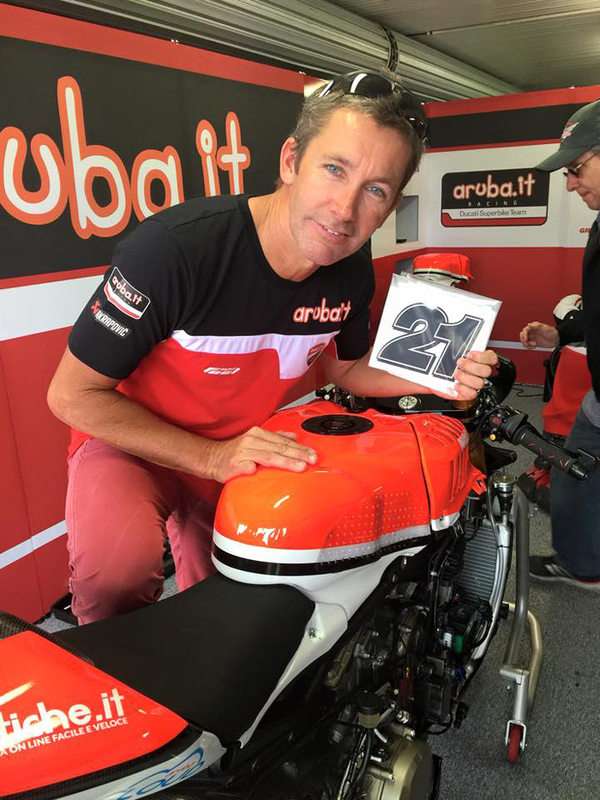 Bayliss will race the Aruba.it Racing Ducati Panigale R under his famous number “21”. The three times former world superbike champion and MotoGP winner, has flown to Melbourne from his home on the Gold Coast this afternoon, in preparation for Sunday’s two 22 lap races in the Swann sponsored round. Bayliss, a long time competitor for Ducati who has remained an ambassador since his retirement at the end of 2008, will be on track from 11.45 am Friday for first practice. The Australian legend will take on the world’s best superbike young guns - some of the 25 strong field are more than half his age including 19 year old French Kawasaki rider, Christophe Ponsson. – Continued in the column at right. 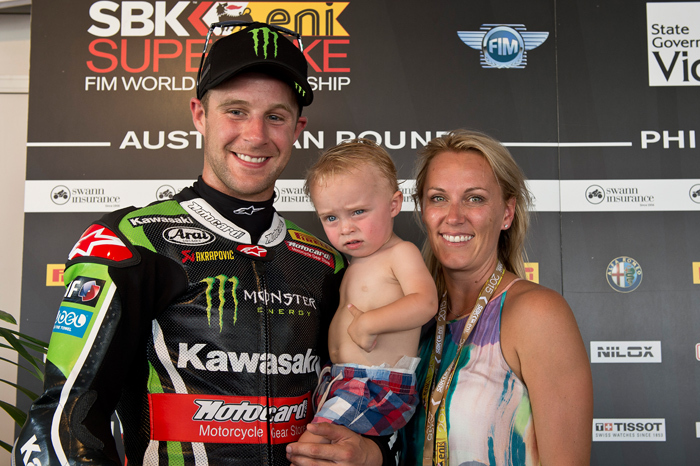 A happy Jonny Rae and family, on top in Superpole in his first race weekend on the new Kawasaki. Davies and Haslam on the front row, Sykes and Guintoli in 8th and 9th place. Superpole, Saturday 21st - Jonathan Rea (Kawasaki Racing Team) will start the opening races of the 2015 eni FIM Superbike World Championship from Pole Position after successfully edging out fellow Britons Chaz Davies (Aruba.it - Ducati Superbike Team) and Leon Haslam (Aprilia Racing Team - Red Devils), who will join him on the front row. New 2015 season Kawasaki Racing Team signing Jonathan Rea took his Ninja ZX-10R to pole position after Superpole 2 was cut short by a red flag incident, meaning Rea scored his first Kawasaki Superpole win at the first attempt. Tom Sykes (KRT) was unlucky to not have a real chance to set a fast lap early on because the second Superpole session would not run its full course. Rea set his pole lap on a race tyre and like the rest of the main riders was set to make another lap on a qualifying tyre. After David Salom (Kawasaki Team Pedercini) suffered a fast and hard highside crash the Superpole 2 session was red-flagged and eventually not restarted, leaving Rea on pole and in the perfect starting place for Sunday’s two 22-lap races. Salom underwent medical checks at the circuit after his crash and has not suffered serious injuries. Kawsaki team mate Sykes was left disappointed to not have the chance to set a fast lap of his own as he was preparing to go for his ultimate lap time when the red flags came out. Because the session was not restarted to run its full planned 15-minute duration he is now faced with a third row start on Sunday. Tom was particularly disappointed because he had realistic ambitions of being on the front row after finishing second in the free practice session that precedes Superpole. Rea’s competition was fierce as Davies and Nico Terol (Althea Racing Team Ducati), could have elevated themselves to pole and second place respectively had not the red flag come out during their quick lap attempt, due to the heavy highside suffered by David Salom (Team Pedercini Kawasaki) with four minutes to go - which drew Superpole 2 to an early close. The Spaniard, who was thrown off his ZX-10R at turn 11, was immediately transported to the circuit’s Medical Centre and then lifted to the Royal Melbourne Hospital for further checks. The heavy crash experienced by Salom looked severe but David was conscious afterwards, talking, moving his limbs and not seriously injured – although heavily beaten up in the trackside gravel. He qualified an eventual 11th, having made it into Superpole 2 directly, after ending combined qualifying eighth quickest earlier in the day. Michael van der Mark (Pata Honda World Superbike), Alex Lowes (Voltcom Crescent Suzuki) and Terol will start from row 2 while Jordi Torres (Aprilia Racing Team – Red Devils), Tom Sykes (Kawasaki Racing Team), Sylvain Guintoli (Pata Honda World Superbike) and Matteo Baiocco (Althea Racing Team) completed the top 10. The Italian rider, along with Leandro Mercado (Barni Racing Team Ducati) were the two riders able to qualifying to the second Superpole session. Last year’s STK1000 winner, however, was later disqualified due to using two qualifying tyres in Superpole 1 and will start the two opening races of the year from the back of the grid (24th place). The 4.445km long Phillip Island circuit is expected to offer its usual tough challenge to all comers on Sunday, especially as temperatures are expected to be hot and the track temperatures correspondingly high. The Rea (65), Haslam (91), Davies (7) fight for the lead was this close lasting all race long with Rea holding on for the win. SUPERBIKE RACE ONE Sunday 22nd - The opening race of the 2015 eni FIM Superbike World Championship was held in hot and sunny conditions at the Phillip Island circuit with Jonathan Rea (Kawasaki Racing Team) taking the opening victory of the year after a titanic 22-lap fight with Leon Haslam (Aprilia Racing Team – Red Devils) and Chaz Davies (Aruba Ducati SBK), who completed an all-British podium. In stepping atop the podium for the sixteenth time in his career, Rea also scored his first top-3 finish at the Island . Furthermore, for the second year in a row the winner of race 1 was a rider on his first outing with new machinery. 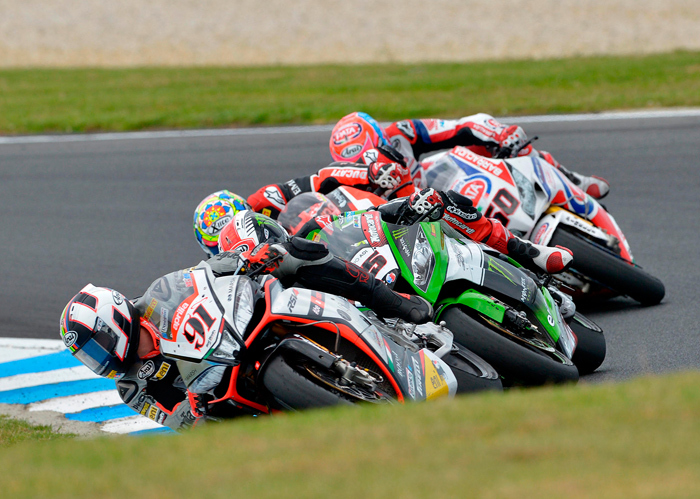 The two WorldSBK rookies Jordi Torres (Aprilia Racing Team – Red Deviles) and Michael van der Mark (Pata Honda World Superbike) impressed in their debut encounter in the series by finishing in fourth and fifth places, respectively. Former Moto2 rider Torres looked at times able to challenge for the podium, while reigning WSS Champion van der Mark slowed down his pace in the last quarter of the race. Tom Sykes (Kawasaki Racing Team) made a good recovery to end up sixth after running off track on lap 6, following an overtaking manoeuvre by van der Mark. Reigning Champion Sylvain Guintoli (Pata Honda World Superbike), Nico Terol (Althea Racing Team Ducati), Alex Lowes (Voltcom Crescent Suzuki) and Leon Camier (MV Agusta Reparto Corse) rounded out the top-10. Lowes had a hard time catching up after being slowed down by a collision in the early stages of the race. Troy Bayliss (Aruba Ducati SBK) ran as high as 7th before eventually fading to 13th just ahead of local wildcard rider Jed Metcher (Race Center – Demolation Plus) who was elated at scoring 2 points on his WorldSBK debut. Niccolò Canepa (Team Hero EBR) was the only faller, he was taken to the medical centre for further checks. Racing was again this close in race Two with Haslam (91) holds a brief lead mid-race over Rea, Davies and van der Mark, soon to be passed by Rea and Davies, with Leon then slipstreaming Rea at the finsh lineby scant inches to win by just .001 secs! Race Two Battle Sees Haslam snatches victory from Rea at finish line by .001 secs! 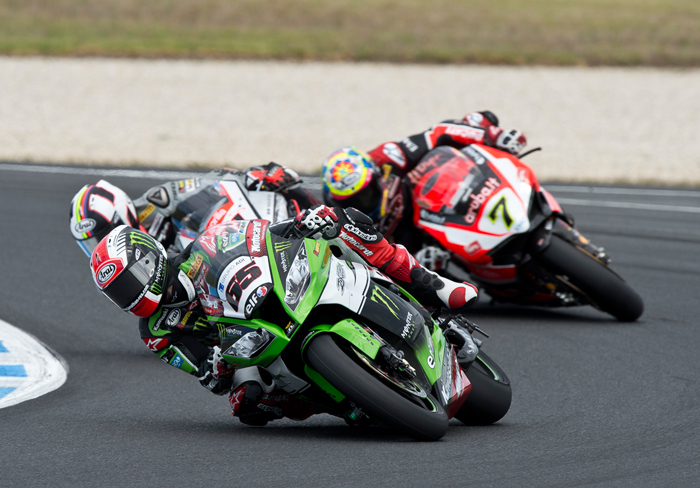 RACE TWO Sunday Feb 22nd - The second race of the Swann Insurance Australian Round was another one to remember, given the thrilling finale that saw Leon Haslam (Aprilia Racing Team – Red Devils) edging out Jonathan Rea (Kawasaki Racing Team) for the win at the finish line by just 0.010. The 31-year-old from Derby, England, enjoyed better drive out of the last turn and managed to get on the outside of Rea, eventually prevailing over his rival by the smallest margin. The two former team-mates are now tied at the top of the standings with 45 points apiece. 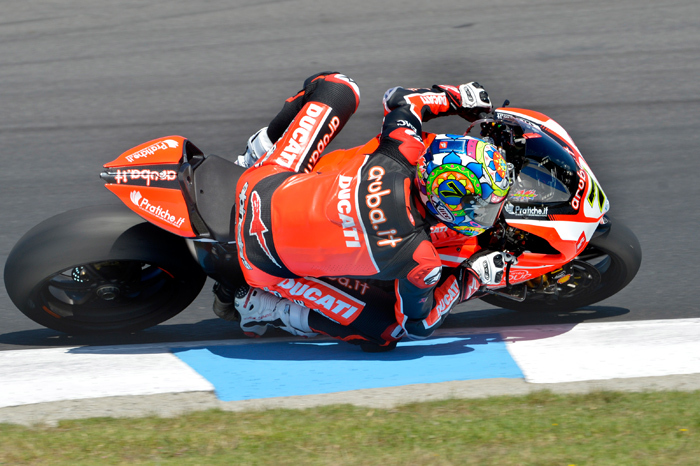 Chaz Davies (Aruba.it Racing – Ducati Superbike Team) completed a solid weekend by again finishing in third place. Chaz Davies (7) showed the 1199 Panigale was now compettive by passing lead for a bit over Rea and Haslam. Ironically enough, the last time Haslam stepped atop the podium was in 2010 at Kyalami (Race 2), when he managed to defeat Rea by half a second. Tom Sykes (Kawasaki Racing Team) was fourth at the chequered flag, ahead of Sylvain Guintoli (Pata Honda World Superbike), Nico Terol (Althea Racing Team Ducati), Randy de Puniet (Voltcom Crescent Suzuki) and Leon Camier (MV Agusta Reparto Corse), with six different manufacturers within the top-8. Reigning World Supersport Champion Michael van der Mark (Pata Honda World Superbike Team) had his shot at the lead throughout the race, eventually dropping down to fourth in a single lap. The Dutchman then lost some more ground to the front runners before crashing out of turn 10 at the end of Lap 19, thankfully without injury. Jordi Torres (Aprilia Racing Team – Red Devils) also fell a lap earlier, losing the front of his RSV4 RF at Turn 1 on Lap 19 while he was running in fourth place. 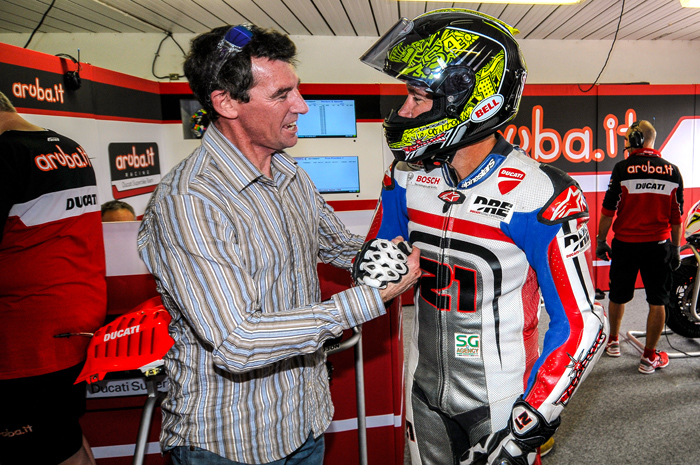 Two legendary Aussie World Superbike Champions, Troy Corsr stopped by to wish Troy Bayliss good luck before the race. Troy Bayliss (Aruba.it Racing - Ducati Superbike Team) started well, once again moving through the field making it as high as 7th and posting the Fastest Lap of the Race at that point, until the triple champion entered the pits to change his front tyre on lap 14. He rejoined finishing just outside of the points in 16th. Troy had expressed an interest to continue substituting for the injured Giugliano and the next WSBK race in Thailand as well, until his wife Kim heard and promptley quelled that notion. Niccolò Canepa (Team Hero EBR) was ruled unfit following his race 1 while Alex Lowes (Voltcom Crescent Suzuki) was forced to pull out of the race due to a technical problem at the end of lap 2, after starting the encounter from the pit-lane. Races winner (16) Jules Cluzel / MV Agusta leads the Supersport Start. Superspoet 600cc - After an 18 lap World Supersport opener, Jules Cluzel (MV Agusta Reparto Corse) came out victorious ahead of his new team mate Lorenzo Zanetti, with WSS returnee Gino Rea (CIA Landlords Insurance Honda) joining him on the first podium of the year. The leading duo were involved in a fight in the early laps before gradually breaking away from the 3rd place fight involving Rea, supersport rookie Kyle Smith (Pata Honda WSS Team) and Ratthapark Wilairot (CORE Motorsport Thailand) who completed the top 5 in that order. For Cluzel it was the second year in succession that he has tasted the winner’s champagne in Australia after winning the shortened opening race 12 months ago. Former champion Kenan Sofuoglu’s challenge for the win ended at the start of lap 6, the Turk running off track at speed at turn one aboard his Kawasaki Puccetti Racing machine. He was able to rejoin finishing 6th at the flag after setting the fastest lap of the race on lap 7. Dominic Schmitter (Team Go Eleven Kawasaki) finished grabbed a top ten finish 9th on his WSS debut ahead of local wildcard Aiden Wagner who raced his Oz Wildcard Racing Yamaha to a very credible 13th. Glenn Scott (AARK Racing Honda) followed his compatriot home in 14th place. Lucas Mahias (Intermoto Kawasaki Ponyexpress) was disappointed to retire to the pits four laps from the end after making a claim for the podium in the first half of the race. Did we forget anything? - Oh yes! 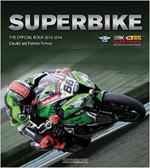 The new FAST 2015 Calendar Yearbook Digital Edition features in high resolution every page in the new 2015 Fast Dates World Superbike, Iron & Lace Custom Bikes, Garage Girls and Cafe Racers Calendars featuring the world's top race and custom bikes and the beautiful Calendar Kittens! Up close detail shots of the race bike and full-size screen saver photos with SBK Fast Dates Calendar Kittn Petra. Imagine Vehicle's Honda CBX Best of Show Winner! Detail Photos and Full Size Screensavers with Calendar Kitten Petra. The Yamaha FZ-09 has been a huge success, garnering enthusastic praise from riders and the media alike. 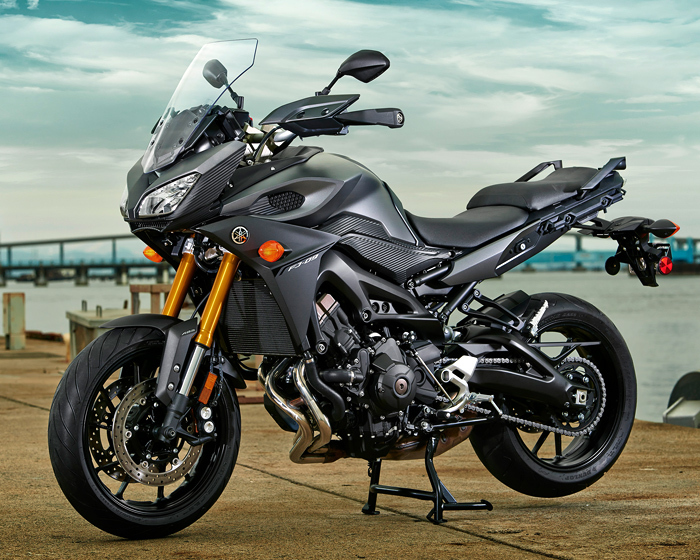 And now, Yamaha takes the popular FZ-09 sportbike formula and adds even more versatility with the all-new 2015 FJ-09. The FJ-09 utilizes the FZ-09’s crossplane-concept, liquid-cooled, four-stroke, inline-three-cylinder, 847cc, fuel-injected engine in a versatile package that provides a sporty, agile, and comfortable ride for everything from daily commuting, to spirited canyon-carving, to full-on touring. With excellent acceleration, response, and handling characteristics, the FJ-09 offers an upright riding position for a stress-free, comfortable experience, whether riding solo or with a passenger. The FJ-09 sports a whole host of position-adjustable components--including windscreen, handlebars, and seat--designed to further accommodate a wide range of riders and riding preferences. And the large, 4.8-gallon fuel tank enables you to log a lot of miles between fuel stops. In addition, the FJ-09 comes equipped with electronic control technologies that include YCC-T (Yamaha Chip Controlled Throttle), ABS (Anti-lock Braking System), and TCS (Traction Control System) to ensure smooth-running performance. And, as if that weren’t enough versatility and adjustability, the bike also features the Yamaha D-MODE (Drive Mode) variable-throttle-control system, which allows the rider to choose the optimum engine character for their riding situation. Yamaha will offer a complete range of custom accessories for the FJ-09, including a top case, side cases, taller windscreen, heated handgrips, and a comfort saddle seat. The 2015 FJ-09 will be available in two color options--Matte Gray and Candy Red--and will retail for $10,490, with bikes available in dealerships beginning in December. For more information on all Yamaha models--including features, specifications, photos, and videos--please visit www.yamahamotorsports.com. 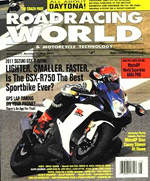 Also, check out “YamahaMotorUSA” on your favorite social media site. Wed Feb 11th 2015 - Dorna WSBK Organization and the FIM, Fédération Internationale de Motocyclisme, regret to inform of the cancellation of the Russian Round scheduled to be held at Moscow Raceway on July 5th 2015. The Russian event promoter, YMS Promotion, has not provided the required contract guarantees defined by DWO to confirm and implement the event organisation. The Round will not be replaced and the 2015 WSBK Calendar will consist of the 13 confirmed events as included in the enclosed document. As a consequence, the Moscow Region Yakhnich Motorsport Team which applied to the FIM Supersport World Championship will not participate in the series for the 2015 season. The Australian legend will take on the world’s best superbike young guns - some of the 25 strong field are more than half his age including 19 year old French Kawasaki rider, Christophe Ponsson. 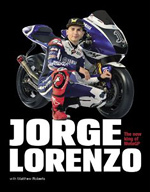 The father of three who was born in Taree, retired from racing on a high when he won his third world superbike championship. He has not competed in a world championship round since. The last time he raced at Phillip Island, on March 2, 2008 on the then new Ducati 1098, he won both races. Over his world supers career he won six races at the island, an achievement only bettered by his compatriot Troy Corser who scored seven victories. Bayliss replaces the injured Davide Giugliano who crashed in testing on Monday afternoon at the Victorian circuit and suffered small fractures to his L1 and L2 vertebrae. He is unable to return to racing for a period of 90 days. Giugliano has proven the Ducati Panigale R bike to be very fast, quickest at Jerez in late January testing and also in the top pack at the island in Monday’s morning test session, prior to his afternoon crash. Once the Ducati seat became available, Bayliss was keen to race especially on the occasion of a record 25 years of world superbike racing at Phillip Island. “I want to start by saying that I really feel for Davide and that it’s a real shame for his season to be starting this way, “ said Troy. “The desire to be able to return to the track and see my home crowd and the Ducatisti has always been strong, ever since I last raced and then also to race at Phillip Island, one of my favourite tracks as they celebrate 25 years of world superbikes. “This gave me the idea to compete as a wildcard and work with the Ducati superbike technicians once again. Bayliss is one of Australia’s most prolific winners in the world of motorcycling racing having amassed 52 wins and 94 podiums in world superbike racing with Ducati, and one win and five podiums in MotoGP competition. He won his world superbike championships in 2001, 2006 and 2008 – all for Ducati. Troy also has developed his own flat-track dirt event, the Baylisstic Scramble, which will be staged this weekend at Phillip Island on a new course built behind Lukey Heights. But now with his commitment to the Ducati world superbike squad on the Phillip Island bitumen, he’ll be a busy man and plans to juggle the dirt and the track. 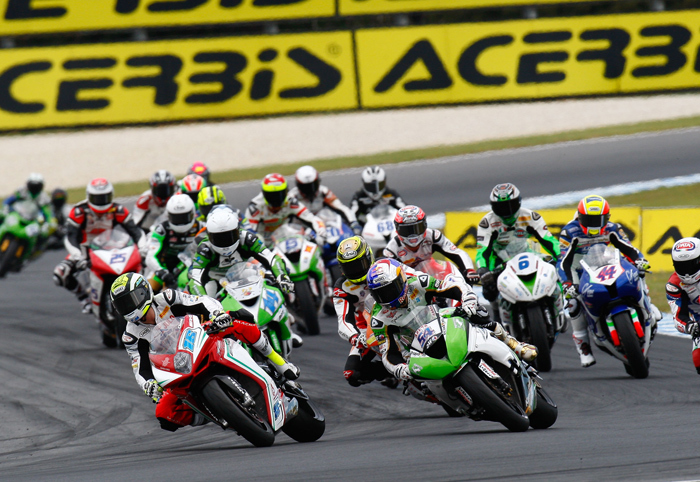 The opening round of 2015 FIM Superbike World Championship, Swann round, will be held this Friday to Sunday, February 20-22 at the Phillip Island Grand Prix circuit. Action starts Friday at 9am with practice and first qualifying; final qualifying Saturday; and two 22 lap races in world superbike (noon and 2.40pm) and one 18 lap race in world supersport (1.10pm) on Sunday. 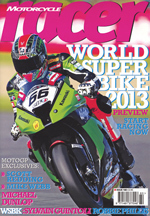 For event information go to www.worldsbk.com.au. Tickets available at gate – Kids 15 and under are free. Six times winner – 2002 – race two; 2006 – race one; 2007 – race one and two; 2008 – race one and two (retirement year) . All for Ducati. His retirement year - 2008.